Three species of turtles can currently be found in the Baldwin Hills, most often spotted in the ponds of Kenneth Hahn State Recreation Area and towards the end of the Ballona Creek channel. Despite their relatively abundant presence, none of these turtles are native to the area and are likely the result of escaped or dumped pets. 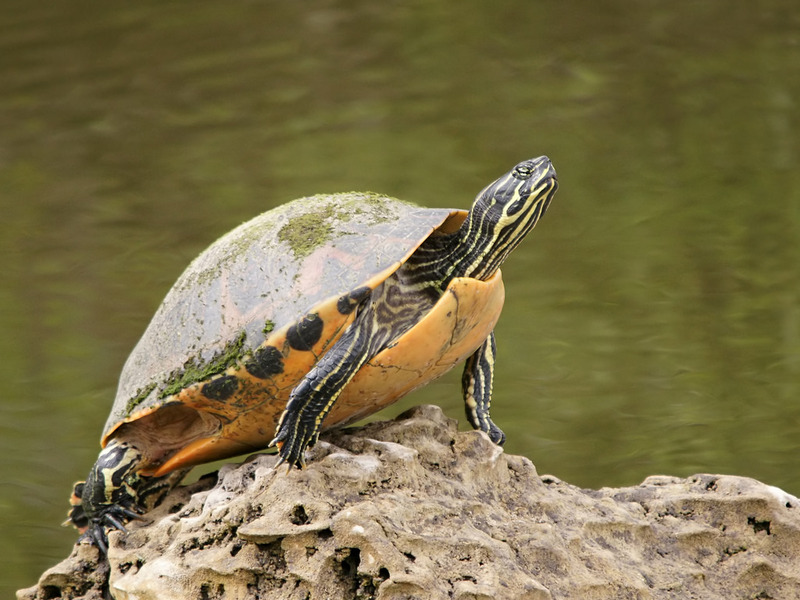 The greatest number of turtles are likely to be seen basking on rocks and logs or swimming at Gwen Moore Lake and the Japanese Garden pond in Kenneth Hahn State Recreation Area. The Red-eared Slider Turtle may not be native to California, but has become very common and widespread across the world as pet owners release them into the wild. This is also the most common turtle species that you are likely to spot in the Baldwin Hills area. As their name suggests, the Red-eared Slider can be identified by the small red stripe on the sides of its head. Surveys from 2014-15 observed or trapped this turtle at Holy Cross Cemetery Pond, Gwen Moore Lake, the Japanese Garden pond, and the middle pond in Kenneth Hahn. It was also found at Ballona Creek where the concrete channel ends. Less invasive than the Red-eared Slider, the Soft-shelled turtle is a much rarer sight in the Baldwin Hills area. At least one was spotted at the lower end of Ballona Creek during the 2014-15 survey and none were seen in Kenneth Hahn State Recreation Area ponds or elsewhere in the hills. 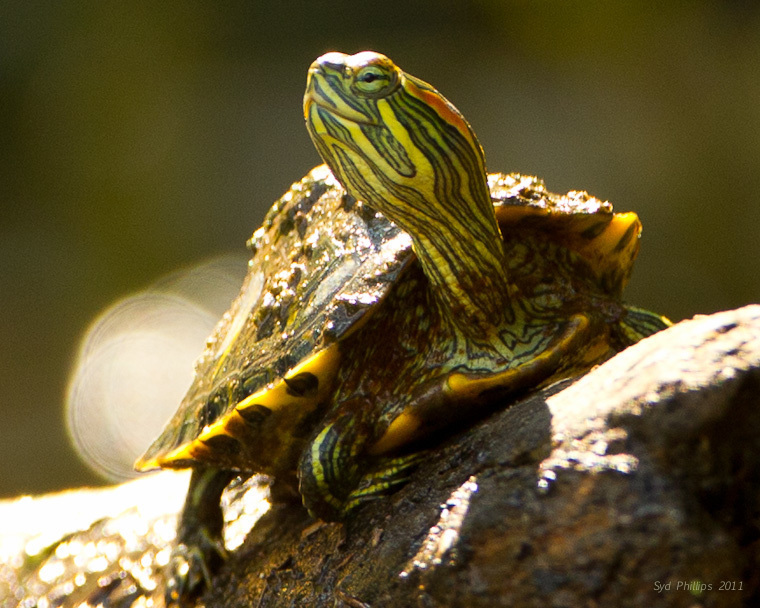 Like the Red-eared Slider, the Soft-shelled Turtle’s presence is the result of abandoned pets and is likely to eventually appear in Kenneth Hahn ponds. Although observations have not been able to confirm the type of Soft-shelled Turtle, it is likely a Spiny Softshell, a common introduced species in California. Besides its distinctive soft shell, this turtle can also be identified by their long, pointy nose! The River Cooter is another introduced species that has been seen in the lower parts of the Ballona Creek. With a native range in the southern and eastern parts of the United States, this turtle is another species that is the result of pet abandonment in urban aquatic habitats. This freshwater turtle is not nearly as abundant as the Red-eared Slider, as only one individual was seen in the 2014-15 survey. The River Cooter is not easy to identify, but you might notice a network pattern across its shell.